This Women’s Month, demonstrations were held in three different provinces and organized by different people and groups in Canada. The message, however, is clear: End all forms of violence not just against women. EDMONTON, Alberta – Women’s rights advocates celebrated the Women’s Month in Canada by bringing to the fore the plight of women migrant workers. Protest actions were staged in three different provinces: in Edmonton, Alberta on March 3 and March 11; in Toronto, Ontario on March 3 and in Montreal, Quebec on March 8. 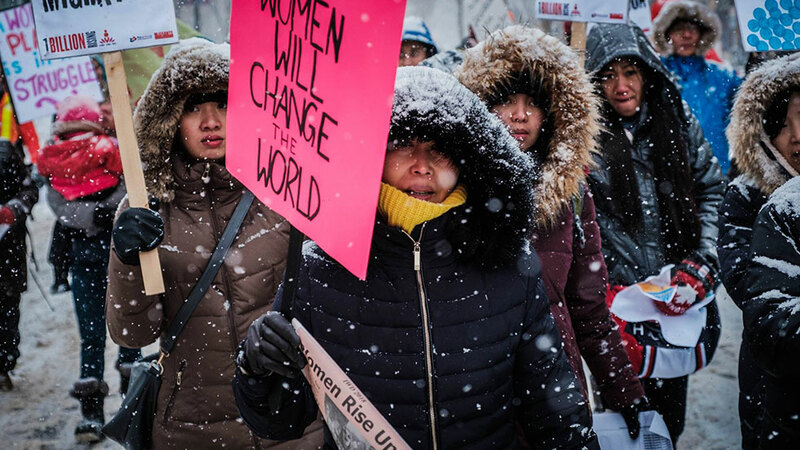 Under the theme “Women’s Dignity Lies in the Fight for the Rights of All,” advocates in Edmonton braved the 10 cm-snow deep road and the snowfall warning in effect on March 3 and held a demonstration. After the march, the rallyists warmed up inside the Old Strathcona Performing Arts Centre where they shared food and performances, which included the One Billion Rising (OBR) dance led by Migrante-Alberta. In Montreal, about 600 marchers in Montreal responded to the call “Women Rise! Unite our Forces! Smash Capitalism and Patriarchy!” and joined the demonstration organized by Women of Diverse Origins (WDO). In Toronto, a 30-minute program fired up the March 3rd rally, with statements read from Gabriela-Ontario, Anakbayan-Toronto, Bagong Alyansang Makabayan (Bayan) and Latin-American women. The program ended with the OBR dance, which then kick-started the march. These protest actions highlighted the cases of women who became victims of abuse and violence. Tina Fontaine was a 15-year-old girl from the Sagkeeng First Nation who was in the care of Manitoba Child and Family Services (CFS) when she was reported missing to the Winnipeg Police Service on July 31, 2014. Her body was found wrapped in plastic and a duvet cover and weighed down with rocks in the Red River on Aug. 17, 2014. Her death is a prominent case among the high number of Missing and Murdered Indigenous Women of Canada and the criticized child welfare services. In honor of the young girl, Lyla Luciano of Migrante Youth-Alberta, sang “Light a Candle for Peace,” a song composed for Fontaine by Filipino musician and Migrante-Manitoba member Levy Abad. The groups also paid tribute to the 41 girls who died in the fire while locked in a room of the youth shelter, Hogar Seguro de Asunción, in Guatemala City on March 8, 2017. In addition to allegedly being beaten and raped by staff, survivors reported that their friends had also been forced into prostitution. A minute of silence was observed in memory of all these women. 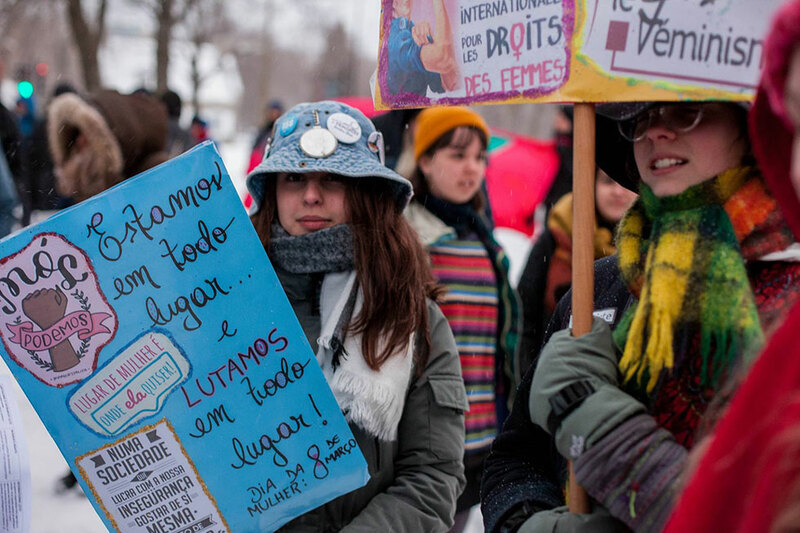 In Montreal, “women workers, migrants, students, came out because they are fed up with sexual harassment and sexist policies, racism and the impoverishment of women and families; students came to protest against the unpaid internships they have to perform in traditionally female professions; we demanded the $15 minimum wage now,” said the WDO statement. The Montreal demonstration also heard women from around the world talk about struggles in war-torn countries, such as the Israeli apartheid and the Kurdish women struggle for the survival and liberation of their people, while the singing of the folk song “Arirang” in Edmonton called for the reunification of the Korean Peninsula. Meanwhile, Migrante-Alberta remembered women overseas Filipino workers (OFWs) whose deaths reflect the most detestable consequence of the Philippine government’s labor export policy and neglect of modern-day heroes. In February, domestic worker Joanna Demafelis’ body was found inside a freezer after over a year in an abandoned apartment in Kuwait. In Kuwait alone, there have been 196 cases of OFW deaths since 2016, according to the Philippines’ Overseas Workers Welfare Administration (OWWA). Of the 196 cases, 22 were reportedly due to suicide. One of them whose fate is still uncertain is Mary Jane Veloso, 33, currently on death row in Indonesia since 2015 for drug trafficking. Indonesian President Joko Widodo gave Veloso reprieve from a death sentence in 2015 following proceedings of the illegal recruitment and human trafficking case filed against Veloso’s alleged recruiters Maria Cristina Sergio and Julius Lacanilao. However, Anakbayan-Toronto said it is no less than the Philippine Court of Appeals that is failing Veloso after it denied her request to provide a recorded testimony in the case against her recruiters. In Canada, caregivers, who are mostly women, are now facing economic uncertainty. The federal government has recently declared review of its five-year revised caregiver program, sending a wave of anxiety to those who have yet to secure permanent status before it’s end on Nov. 29, 2019. 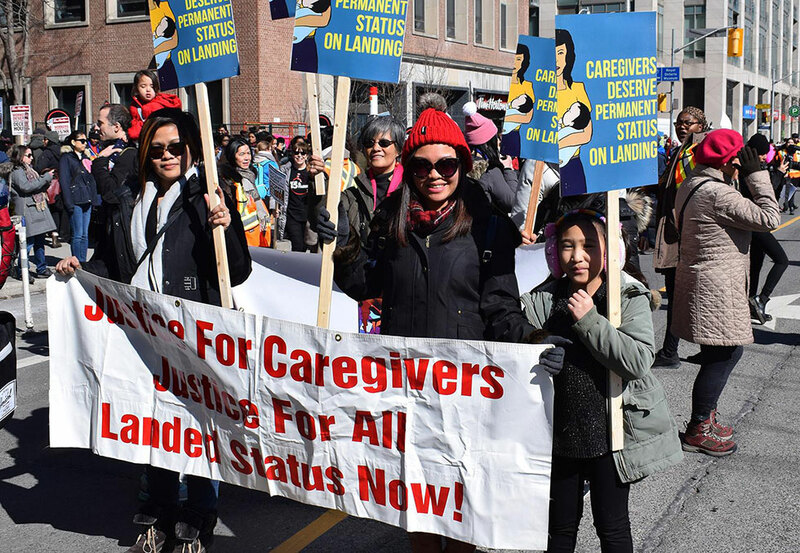 Despite this, the Alberta Caregivers Association (ACA), a new member-group of Migrante-Alberta, said that “caregivers deserve to be treated with dignity” as they care for the very foundation of Canadian society, the Canadian families. ACA recognizes the need to bring together issues of low wages, employer abuse, tied work permits, permanent residency backlog and family reunification. At the same time, the groups also celebrated women’s heroism. The Filipino groups in Toronto marched under the name “The Pet Cleto Contingent.” Cleto, who passed away in January, was a Filipino immigrant who dedicated her life to the cause of migrant workers, women’s liberation and the fight against imperialism. In Montreal, Women of Diverse Origins (WDO) led the tribute to some of the inspiring women who died last year: Abby Lippman, professor and activist, WDO member; (Petronila) Cleto, journalist and activist from Gabriela-Ontario and; Asma Jahangir, a Pakistani lawyer and human rights activist known for her commitment to the most oppressed. WDO spokespersons Jasmin de la Calzada and Marie-Claude Manga acknowledged the Mohawk Nation for hosting the rally on their unceeded aboriginal territory. The gathering place, Place du 6-décembre-1989, also bears significance as it was declared a memorial site for the 14 young women murdered by a misogynist during the massacre at École Polytechnique de Montréal in 1989. Among the performers were Béa Di Vinci, a Filipino-American rapper who performed a spoken word denouncing the systemic violence against aboriginal women and girls in Canada. The WDO salutes the courage of women who have denounced the assaults and harassment they have experienced from men in power and the #MeToo# campaign. And to those women who have not been able to denounce the assaults they have suffered because it is too dangerous for them, they are fleeing the war, or their rights are not recognized, “we want to demolish the systems that allow these power relations and the patriarchy to persist, so that no woman has to worry about losing her job, her reputation or her life to live with respect and dignity,” said the WDO. When it’s the person in the highest office who “personifies misogyny by the language he uses to publicly harass, berate, mock and humiliate women, Migrante-British Columbia’s (BC) Women’s Organizing Committee said “it sets the tone in the Philippines, encouraging the local law enforcement and the military to follow suit. Migrante-BC agreed that while their ties with the home country are always strong and always warm as Filipino-Canadian women overseas, “we forge strong the women’s anti-imperialist solidarity with other women” as women overseas.